There are two kinds of far-field measurement: gated and not-gated one. In the gated measurement we set the markers so that we limit the data to be used to calculate the frequency response. Eliminating reflections from the measurement in this way allows anechoic testing to be conducted in a normal room. The relationship is a simple one: if you apply a time window of 6 milliseconds (0.006s �not unusual for measurements conducted in a typical domestic room), then the frequency resolution of the measurement will be limited to 1/0.006 = 167 Hz. The not-gated far-field measurement, instead, uses all the data including the room response, and is useful to see how the speakers will sound in the environment they will be used, helping us understand where to place them. In the far field measurement the microphone is placed at a distance at which the driver looks like a point source and its sound pressure level is inversely proportional with its distance from the mic (6 dB drop for each doubling of distance). The industry standard sets this distance to 1 meter to allow integration of the various drivers in a front baffle, that is by 1 meter usually the woofer and tweeter response have added together so a single test gets both (however when testing speakers that uses line sources, like ribbon or array drivers, the mic-speaker distance is increased to 2 meters). If you are testing drivers separately then you can use any distance that works but be aware that if it's true that a less than 1 meter distance increases the signal to noise ratio, it's also true that a too close distance causes the driver not to act as a point source, thus the measurement cannot be considered far-field. Is common to use a distance equal to 4-5 times the driver diaphragm diameter, but not exceeding more than 1 meter: it rarely works for anechoic (gated) measurements cause the reflections are very close to the signal and you don't get any low frequency response (unless you have a huge measurement room, where floor-ceiling-sidewall reflections happens very late). Using 1 meter or more for far-field (not gated) in-room response is just fine. In the gated measurement it is very important to place the loudspeaker in the room center, so that all the parallel walls are equally far from it. I use to put the speaker on a stand to center it between the floor and the ceiling. Also put some absorbing mat on the floor between the mic and the speaker, as well as on the microphone stand. When the speaker in the middle of the room on the floor, as far as possible away from walls inhibited, then the first reflection is the floor reflection. The chassis under test and the measuring microphone are both at the height of 1 meter above the floor. 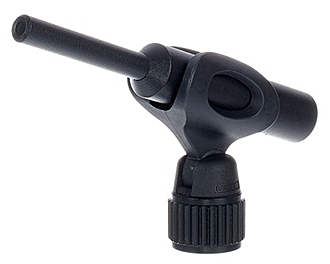 The linear distance X between chassis and microphone is also 1 meter. The floor reflected wave has a greater distance to the microphone. This is basically a delayed version of a primary signal that is produced when two or more loudspeakers are playing the same signal at different distances from the listener. In any enclosed space listeners hear a mixture of direct and reflected sound. Because the reflected sound takes longer to reach our ears, it constitutes a delayed version of the direct sound and a comb filter is created where the two combine at the listener. The extent of its audibility depends on how lively the room is to allow the reflected sounds to average out the overall response. Note that this interference may be constructive (additive) or destructive (subtractive). 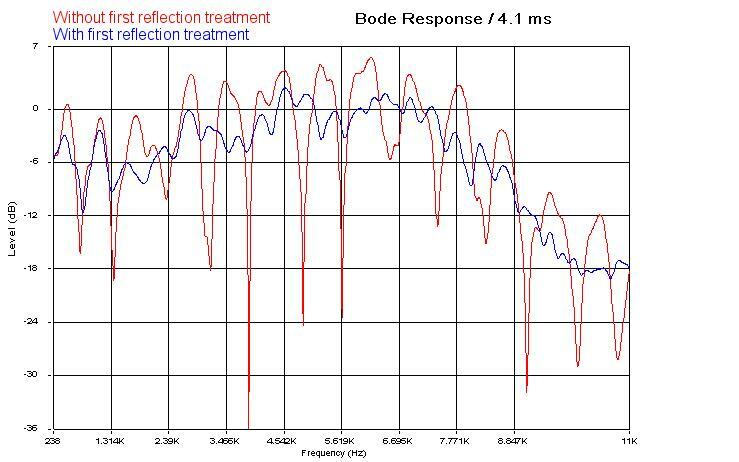 Early reflections are those which reach the listener within a delay of 15 ms relative to the direct signal. The retarded sound creates phase problems by combining to the direct one. The result is numerous dips in the frequency response. From fig. 2 becomes clear that sound energy starts arrive after roughly speaking 2.7 ms at the mictofoon. This sound front is followed by response in the form of a subdued ultrasound which is reduced after 6 ms to a very low level. 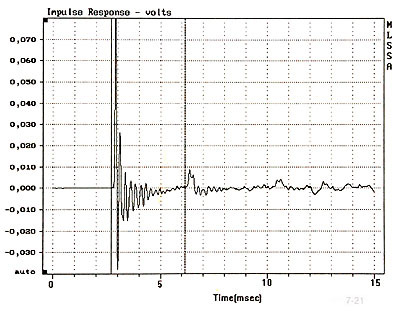 After 6.3 ms a second, smaller quantity of sound energy arrive. This is the floor reflection. A third front on approximately 10.5 ms is the reflection against the ceiling. Finally we see a fourth (negative) front at 12 ms, this is the reflection against a sidewall. First refection (-dB) at 180°, Second reflection (+dB) at 360°. Click here to read about Near - Field Measurement or Ground - Plane Measurements.